Saturday, April 20th, 2019 | Engage. Connect. Plug-in. 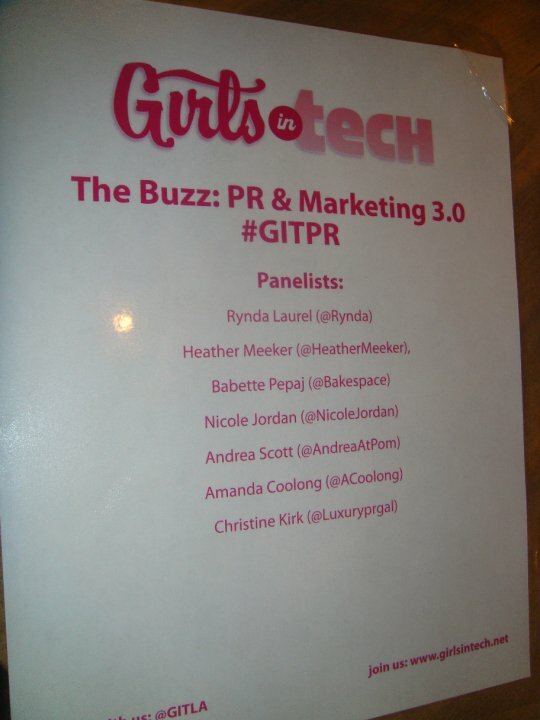 On April 22, the Los Angeles chapter of Girls in Tech hosted an incredibly successful PR & Marketing 3.0 panel. The turnout was above and beyond what we expected and we were thrilled to be able to engage so many great minds on such a relevant topic. The amazing panelists (if I do say so myself) were: Rynda Laurel @rynda (AF83, Bearstech & Hackable:Devices), Heather Meeker @heathermeeker (Whrrl), Babette Pepaj @bakespace (Bakespace, TechMUNCH & The Daily Bits), Amanda Coolong @acoolong (Tech Zulu, ThisWeekin.com & Beta PR) and me, Christine Kirk @luxuryprgal (Social Muse Communications). Unfortunately, the equally wonderful Nicole Jordan (Mobile Roadie) and Andrea Scott (Pom Wonderful) had last minute commitments that kept them from being on the panel as originally scheduled. One thing for sure is that we were a group of opinionated, passionate, and incredibly intelligent ladies who had a lot to say. Online communications and the digital world is something we are all deeply involved with in our daily personal and work lives, and it couldn’t have been a livelier conversation. Press releases are still relevant for SEO purposes and are a vehicle to disseminate your brand’s messaging the way you want, and in a controlled environment. Twitter and Facebook aren’t about the number of followers and friends that you have. Social media is about building brand awareness and making a direct connection with your customers and consumers and having a two-way dialogue with them. Twitter Lists are your friend! Use them to create organized groups on different topics, industries, etc. Start with www.wefollow.com for help. Social media is but one arrow in the quiver, don’t get caught with tunnel vision on this one channel of communication, and remember to use the many other avenues available to get your brand out there. Use geolocation services (FourSquare, Gowalla, Whrrl, etc.) as personal brand builders and “legitimize your work through your lifestyle.” If you represent hospitality brands for example, checking in to restaurants, hotels and spas builds confidence that you practice what you preach. How can you avoid Internet stalkers when using geolocation services? Check in when you check out. Only check in when you’re LEAVING a venue, not when you arrive. Only small niches of people are actively on Twitter, so your message may not go far. Identify key influencers in other places online and off who can take your message beyond social media. Geolocation is here to stay, so you better start learning FourSquare, Gowalla, and Whrrl to stay on top of your game. WAw some blog! I am loving it*….. I feel that is a fascinating point, it made me suppose a bit. Thanks for sparking my considering cap. Now and again I am getting such a lot in a rut that I just really feel like a record…. I don’t normally comment on blogs.. But nice post! I just bookmarked your site…. Thanks for taking the time to debate this, I feel strongly about it and love studying extra on this topic. If possible, as you acquire expertise, would you mind updating your blog with further information? It is extremely useful for me…. I’m not eaisly impressed. . . but that’s impressing me! Покидайте пожалуйста контакты ну или ссылки строительных организаций по типу “Муж на час” или “мастер на час” (незнаю как правильно). Christine Kirk Declared a Klout Star!